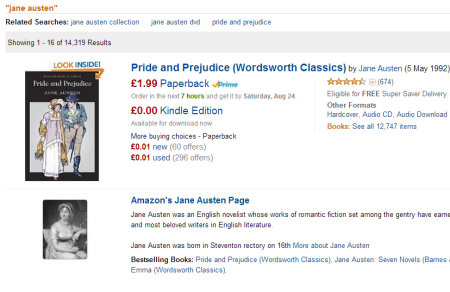 Amazon is a popular online shopping website where you can buy a wide range of new and second-hand items, from books (it started as an online bookshop) and music to computers and cars. 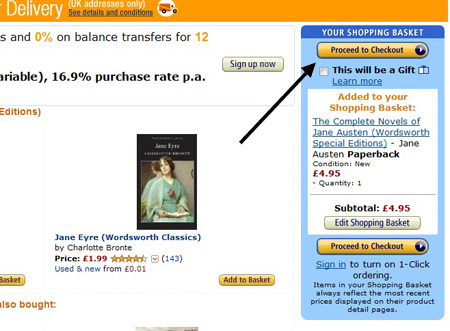 In this guide, we’re going to show you how to buy something from Amazon for the first time. a credit or debit card. Step 1: Go to the Amazon website. 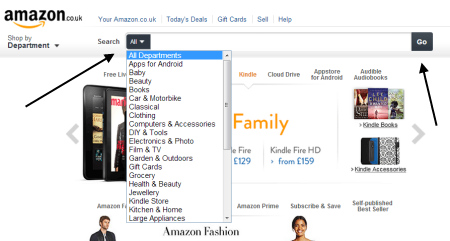 Step 2: If you’re just browsing, click on one of the categories on the left hand side of the screen to see what’s available. If you know what you’re looking for, type the name of the item in the search box along the top of the page and click the black GO button. 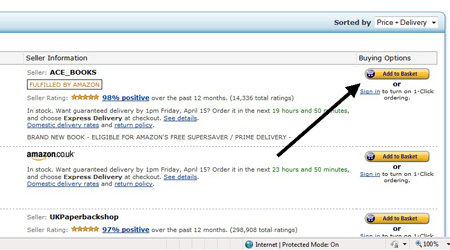 Step 3: A new page will open with a list of items matching your search criteria. You can either narrow your search by typing in more ‘keywords’ in the search box and clicking GO, or you can look through the list you’ve been presented with until you find the item you’re looking for. Step 4: Click the name or picture of your chosen item. A new page will open, displaying more details about the product. Scroll down the page to see a product description and customer reviews. If you like the product but want to buy it later, click Add to Wish List and Amazon will save the details. 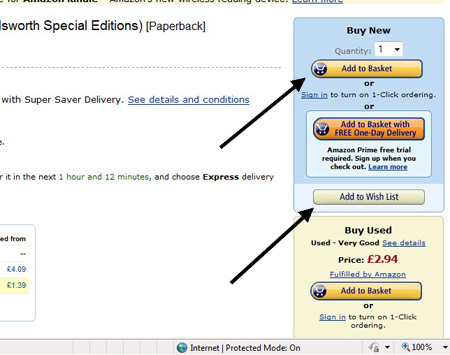 If you want to buy the product now, click Add to Basket. Step 5: Alternatively, if you’re a bargain hunter, you can browse through other new and used versions of the same product, which are also for sale. Click on [No.] new or [No.] used to take you to a list of all the different sellers you can buy the product from and their prices. Step 6: When considering whether to buy from these alternative sellers, don’t only look for a low price when choosing which product to buy. 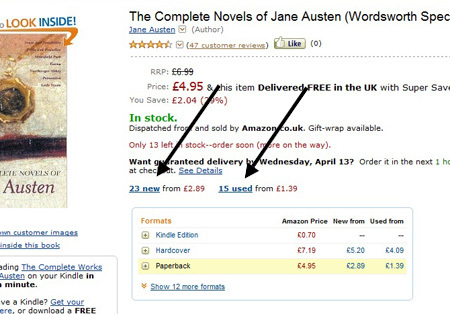 A high seller rating – that is, the number of stars the seller has been given by Amazon – is important, too. Once you’ve made a choice, click Add to Basket. Step 7: As with a real shopping basket, you can now search for other items to add to the one you’ve already got. If you’ve finished shopping, click Proceed to Checkout. Step 8: You’ll now be asked to sign in. If you’re a new customer, enter your email address in the box provided and click on the circle next to ‘I am a new customer’. 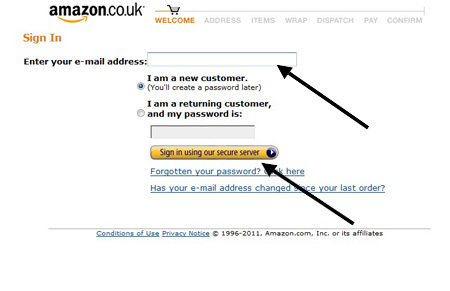 There’s no need to add a password at this point – just click Sign in using our secure server. Step 9: You’ll now be asked to enter a new delivery address. Fill in the boxes provided with your name and the address where you’d like the item delivered. 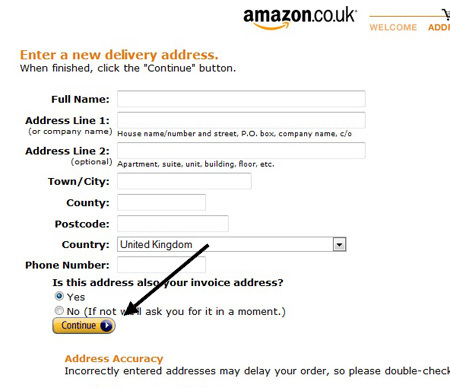 Click next to ‘Yes’ or ‘No’ depending on whether your delivery address is the same as your invoice address, then click Continue. 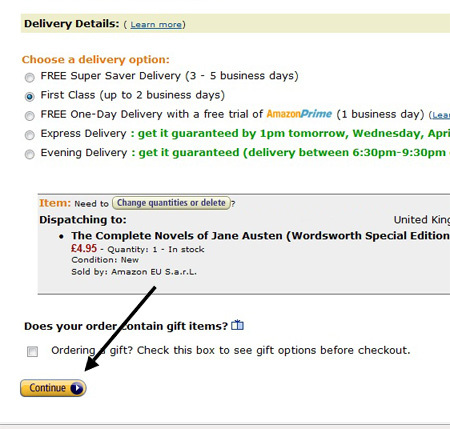 Step 10: A new page will open asking you to choose a delivery option. Those that are free will be marked ‘FREE’. Choose one and click Continue. Step 11: A new page will open asking you to choose a payment option. 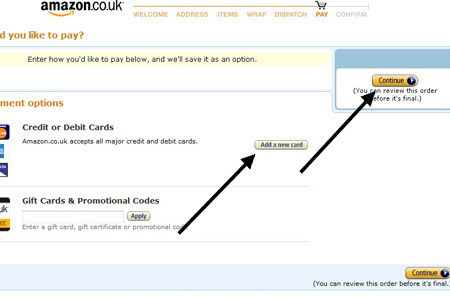 Click Add a new card to add your credit or debit card details. Then click Continue. 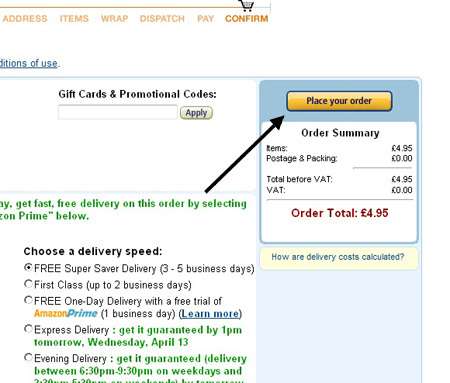 Step 12: You’ll now be shown a review of your order, with the delivery address and billing information. After checking that all the details are correct, click Place your order. Step 13: Sit back and wait for your package to arrive! Now that you’ve registered, Amazon will remember your purchase the next time you sign in and recommend related items that might interest you.